In Wake Of 'Sham Election,' U.S. Sanctions Venezuelan President Nicolas Maduro : The Two-Way The move freezes "assets of Nicolas Maduro [that are] subject to U.S. jurisdiction," the Treasury Department says. It's only the fourth time the U.S. has imposed sanctions on a sitting head of state. Venezuelan President Nicolas Maduro celebrates the results of Sunday's referendum to elect members of his constituent assembly. For this "fundamental assault on the freedoms of the Venezuelan people," the U.S. Treasury announced sanctions on Maduro on Monday. Just one day after a nationwide vote to consolidate Venezuelan President Nicolas Maduro's hold on power, the U.S. Treasury Department has leveled a new round of sanctions against the regime — this time against Maduro himself. "All assets of Nicolas Maduro subject to U.S. jurisdiction are frozen," the department announced in a statement Monday, "and U.S. persons are prohibited from dealing with him." 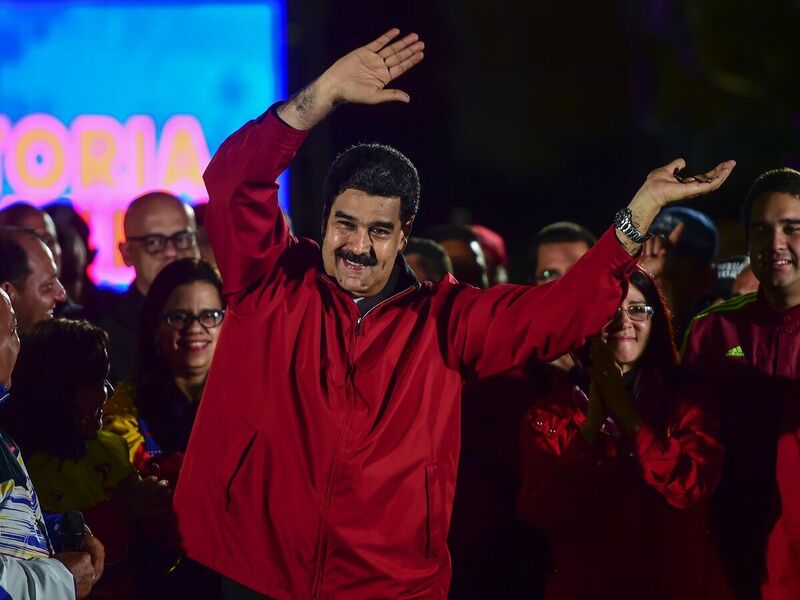 The move, which marks only the fourth time the U.S. has imposed economic sanctions on a sitting head of state, follows a referendum called by Maduro to elect the delegates tasked with rewriting Venezuela's constitution. The constituent assembly elected in Sunday's vote will have the power to dissolve the National Assembly, which is dominated by opposition politicians. "The way that the election was set up ensured that this would be a body that is packed with supporters of Maduro and the ruling Socialist Party," NPR's Philip Reeves explained on Morning Edition. Maduro's "recent actions, culminating in yesterday's outrageous seizure of absolute power through the sham election of the national constituent assembly, represent a very serious blow to democracy in our hemisphere," National Security Adviser H.R. McMaster said at a White House briefing Monday. "Maduro is not just a bad leader. He is now a dictator." Venezuela has been riven by unrest since the country's Supreme Court, which is packed with Maduro supporters, attempted to dissolve the legislature in late March — and quickly reversed itself just days later after international backlash. In the months that followed, more than 120 people have died in clashes between Maduro's security forces and protesters, who have demanded the resumption of indefinitely delayed elections. At least 10 people were killed around the country on Sunday alone. Monday's sanctions are not the first leveled by the U.S. against Maduro's government. Last week, the U.S. targeted 13 current or former officials — but Maduro remained defiant, publicly honoring each of the officials slapped with what he called the "imperialist sanctions." At the briefing Monday, Treasury Secretary Steven Mnuchin would not comment on whether Maduro has any assets in the U.S. Still, he did note that "all options are on the table" going forward. "Our objective is not to do anything that hurts the people of Venezuela," he said, "but let me just say, we will continue to monitor all of our specific options."